Korovai ​Testimonials - I love to see the pictures from your wedding and hear how it went. In the old days, in the village, the korovai'nytsi would have been guests of honor! ​While the korovai was placed in a place of honor there was no welcoming ceremony... The next morning, however, there was a brunch and the bride and groom were welcomed by their families outdoors on a beautiful day.... There was no cake cutting during the wedding reception so the couple chose to cut the korovai and share it with their guests this way. While not traditional, it was a beautiful sight to see the families together, sitting on the hillside of the riverbank sharing the bread. Thank you for this beautiful bread! Thank you for making our daughter's wedding an exceptional event! The korovai was a focal point and during my speech I provided an explanation of Ukrainian wedding traditions and the meaning and importance of the korovai to a group of people that had never experienced or knew about such things. By all accounts I gave a very good address but the beauty and quality of your korovai drew everyone in and by the end of the evening it was about 90% devoured! All in attendance understood the importance of why we presented the korovai and the importance of them partaking in its consumption and everyone was in awe of how wonderful it looked and tasted, it was truly the highlight of the event after the bride and groom. ​Regarding Mini Korovaichyk Anniversary gift: How awesome. I got a call last night from them. They loved it. Made them cry it was so special. Thank you so very much. ​Wow! I love it ! It is so beautiful and impressive! Thank you so much! I know my family will be so very pleased and the bride's family will be impressed! They are so happy to have our tradition be part of the wedding celebration! ​Thanks again for being a life saver. Mission accomplished. Korovai just arrived and looks great, just like your pictures. Thanks for the extra effort to meet a difficult timeline. ​Hello, Lisa - I'm so sorry that it has taken me this long to send you this BIG THANK YOU! Your Korovai was the most beautiful korovai I have ever seen!! It arrived in perfect condition before Noon on Friday just as planned. My sisters thought it was just awesome and so did our wedding guests. I am so grateful to have found you!! The Korovai was such a special addition to my daughter's wedding. We did the traditional entrance with the Korovai. My Godfather spoke about the Ukrainian cultural significance of the Korovai. My parents would have been so pleased to see this. We displayed the Korovai on a beautiful gold framed and mirrored round table with a Ukrainian ryshnyk during the wedding reception. But, we did not serve it to the guests that evening. Instead, we displayed it again the next day and enjoyed it at a special wedding brunch for close family and the wedding party in a lovely courtyard outside at a really nice hotel. So not only was the Korovai beautiful, but it was really delicious too. We served it with honey, and butter and jam. We gave many of the birds to those who asked as a remembrance. Our Ukrainian community here is small. No newsletter or Facebook page. But, I attend the Ukrainian Catholic Church and know many people at the Orthodox church as well. I will tell them all about you when I have photos to share. I also can't wait to show the photos to my family in Ukraine. We have a large family on my father's side in Berezhany (near Ternopil). They will be amazed to see such a beautiful Korovai - and being made here in the US. Lisa - thank you for carrying on this tradition of the Korovai. By sharing your talent like this you are bringing much joy into many peoples lives! ​I simply cannot thank you enough for getting the Korovai delivered in time for our family dinner. 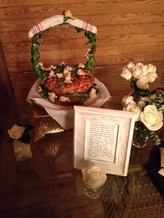 The bride and groom, along with her mother and grandmother, were so surprised to see Korovai on the cake table. It made for the perfect gesture to join our families and recognize their culture and traditions. The Bride shared with everyone the background and tradition of Koravai. In their family tradition, the mother of the bride holds the bread and the bride and groom take a bite of the bread, at the same time. The one who takes the bigger bite is said to be the leader of their new family. It was so cute and wonderful and fun! Again, Lisa, thank you so much. I thought I had exhausted all options and everyone in the family kept telling me not to worry about not having the Korovai; that I had done all I could do. You were my last chance and you delivered! You really are Wonder Woman! And, thank you, for the lesson in Ukrainian toasts. My husband incorporated “Na Zdorovya” and “Mnohaya Lita” into his remarks. At first the Bride, her mom and grandmother, looked a little puzzled and then he repeated himself and their eyes and faces just lit up when they realized what he was saying, and everyone repeated the special toasts. ​Well, the wedding is over...it was absolutely beautiful and I couldn't have wished for a more perfect day! We served your birds at dinner, the hall warmed them up a bit and the clover gave them such a special touch. What fun to open the bread basket and see these adorable birds! IT was beautiful! Thank You! We ate half of it! My sister was starostynia and was very pleased. It tasted like babka and was pretty!!!!! I am so glad I had yours for the pictures we took with it.